> McAfee > Compare solutions from different vendors. 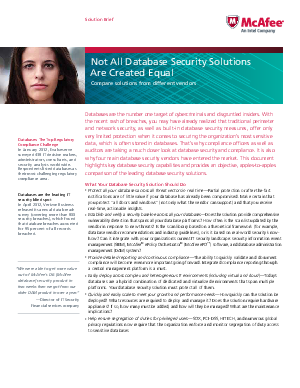 Databases are the number one target of cyber criminals and disgruntled insiders. Traditional perimeter and network security, as well as built-in database security measures, offer only limited protection when it comes to securing the organization’s most sensitive data. That’s why compliance officers as well as auditors are taking a much closer look at database security and compliance, and why four main database security vendors have entered the market.